Hi! 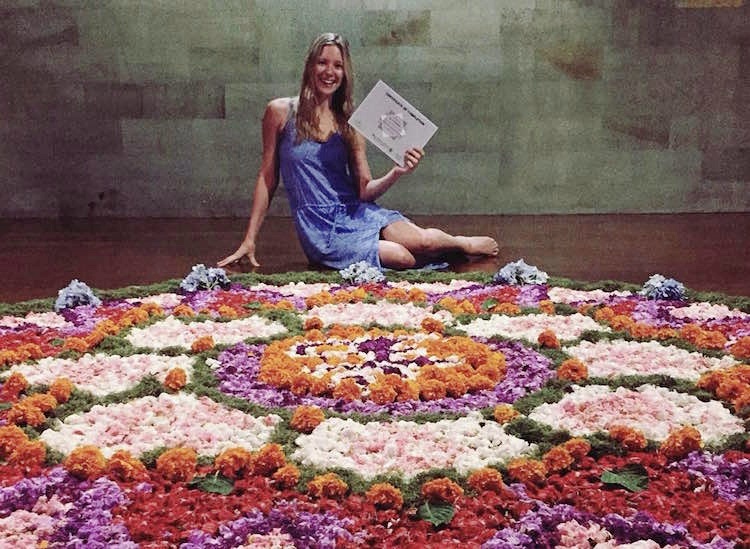 I’m Alina and this is week 4 of my 4-week yoga teacher training in Bali with Routes of Yoga. Join me as I share with you all the things I learned from Daphne and Anton in my bittersweet final week with them in Bali. Think of this as the wrap party to my yoga teacher training diary series, and the exciting start to my journey as a yoga teacher! I say holistic because we start the final week with a Philosophy class (Bhagavad Gita discussion), Teaching Lab session, and pranayama and meditation—making sure we cover all the physical, mental, and spiritual bases of being a student and a teacher. In Teaching Lab, we guide our little group through 16 poses and Anton teaches us vinyasa transitions, and how to open and end a class. He gave us tips on how to introduce yourself, give security affirmations, etc. and we all practiced our class intro and closing with the group. He said there's no one right way to do this; what's most important is you go with your authentic, personal style. After that, Anton introduced us to the long-awaited Business lecture. After having had so many Teaching Labs, we are all very curious about how to go about building our own classes and making our teaching careers sustainable. The lecture forced us to ask hard, but very important, questions: what is your true motivation, your drive? What is it that gets you on the mat? What is your USP (Unique Selling Point)? What do you want to focus on or specialize in? Last but not least, this important lesson: Create your own routine! Have a mantra/meditation/yoga diary and start your won collection of sequences because nothing beats learning from personal experience. At this point, you can tell that everybody is getting slightly nervous about the written exam, which we'll have before the practical one. But this morning, I 'studied' for the practical—timed the asanas, thought about correct cues, what to demo or mirror, and remembering the correct sequence of poses. After Part II of the Business lecture, I taught my first 1-hour class in Teaching Lab and I really enjoyed it. We all had to teach a 1-hour class, which was great practice for the practical exam. We are not allowed to use notes during both exams, so I used my morning self-practice the next day to polish my 30-minute sequence (I did this twice). Daphne's talk about the Gita was great, but it's getting harder to concentrate because we were all thinking of the written exam. Then finally, it was exam time. Anton explains the "rules" and I instantly felt like I'm back in school—nervous and skipping through the sheets. I took a deep breath, worked through all the questions, and instantly felt relieved when I handed in my papers. Day 23 - The Bittersweet Last Day of Training! I am getting all sentimental, realizing that there'll be no more classes led by Anton or Daphne in this breathtaking, stunningly beautiful Shala with the green rice fields and palm trees! I repeat my little sequence to physically and mentally prepare for the practical exams happening after breakfast. The group is divided into two groups, teaching 4 to 5 people, as Anton and Daphne would sometimes join on the mat to see how the classes “feel”. I am a little nervous as I'm one of the first to teach. I try to focus on each class and feel so proud of my co-trainees and the progress we've made! Our only male trainee was assigned with the final spot—alone (since we had an uneven number of participants)—so we spontaneously decided to join for one big class and he guided us through one beautiful, very deep, final practice (including Daphne and Anton). After lunch, we met back at the Shala to have a personal feedback session with our teachers. They have organized bags full of flower petals to give us a chance to create our group's own flower mandala on the floor. For the final ceremony, we were handed our certificates and we celebrated the yogi way—with healthy smoothies and vegan snacks. When saying goodbye to those who have been through this with me, supported me, have given me constructive feedback, I am sad and can’t hold back a few tears. It's hard to put in words how thankful I am to my great teachers. You have guided us through an exciting, wonderful journey where we got to know ourselves better, met our boundaries, helped us to grow further, patiently answered all our questions, supported us in times when we doubted ourselves, and were always talking from a point of your own experience rather than from “knowing better”—all while always keeping a professional attitude. I will be forever grateful for the chance to join ROY's Teacher Training and am looking forward to teaching my first "real" class and integrating this experience into my daily life. Before I left, I wanted to have a quick talk with Daphne and Anton to thank them for making this whole experience so amazing and fulfilling, and to ask them a couple of questions to help me along my journey—and hopefully yours, too! What do you think are important qualities to have to be a good yoga teacher? Anton: The ability to break complex techniques and concepts down to short and simple instructions, as well as the flexibility and attention on the needs of an individual, rather than imposing one approach onto everyone. Daphne: A good heart, a clear mind, and the skillful means to be a bridge of stable support for others. It's not every day that we are up for the challenge, but right at its core is the ability to do an honest practice more and more frequently. One that is willing to face the discomfort of seeing our own shadows and then approaching it with love and kindness. The experience and empathy to help others accumulates through walking our own path first. What do you like about the idea of a universal Yoga? Daphne: The Sanskrit root word for ‘Yoga’ is yuj, meaning to unite or join. It necessitates dissolving the barriers that keep us separate from our true nature and from relating to each other as equals. Consider the sheer potential and consequence of this, and we come to appreciate the potential of the word Yoga itself. Yoga transforms narrow mindedness into a vast broad perspective. There is no room for separation here—no you versus me, just unconditional and universal love. How does your personal yoga practice look like? Anton: It varies. I go with the flow with how my body and mind feels on a particular morning. it can range from a very dynamic asana practice with lots of vinyasas and inversions to a very calm slow practice and long meditation session. Daphne: I’m fairly nomadic and enjoy relating to the peculiarities of place and how it informs a practice. From a room’s orientation and its relation to sunlight, the resultant shifts in sleeping patterns, etc. On the other hand, maintaining some routine and having consistency in my being grounds me regardless of where I am, so it’s a fluid interplay between the two. Practice is a response, it starts with observation. Which yoga projects do you dream about and would like to realize some day? Daphne: I’d wish for a market drive towards longer-format yoga intensives that focus on practice, repetition, and integration. More mid-points between studio classes and teacher trainings. We don’t need as much informational input as we think we do, but somehow that’s where the general focus is in our yoga community. Has your teaching style changed over the years? Anton: Definitely. My teaching is based on my daily practice, which is a constant evolution. This way, I am open to meeting change in my teaching. This precious mechanism of gaining knowledge and then passing it on is what allows us to have access to all this ancient wisdom today, but It needs to be relevant to you to be kept alive. What advice would you give yoga practitioners to keep their own home practice going? Daphne: Know what motivates you deeply. Take whatever time you need to figure this out; it is your inner fire. Practice without motivation is like running a marathon blindfolded—you get tired and frustrated from all the effort, but how many strides were in the right direction? Use the monkey mind against itself. Play out the scenario of how it would feel if you did not achieve these deeply rooted callings. Recognize that there are steps needed to get there. Are you doing your practice in line with your goals or are you taking on someone else's? The person wanting to get fit needs a different practice from someone looking to cultivate the wisdom to help others. If you don’t match the two, you'll get bored and won’t see the results you are looking for. If you are struggling to get on the mat, more often than not, it’s the simple feel-good practices which provide an immediate sense of peace that lures you back. Daphne: I have a vast scale of outputs, but the common thread through them is the intention to use the philosophy of yoga as an underlying approach and a continual ideal. Projects are the realm where high concepts like Union and Oneness have to ground and prove themselves in the manifest world, through a choice or action. How does the word 'holistic' actually look like? Which decision is a step towards love? We Be Rising is an organization I set up to respond to this at a collective level. Its focus is on spreading holistic modalities and mindset into the broader and fringe communities, such as schools and rehabilitation centers. At some point, we have to come together to raise each other up. It's the only way we can speak of Oneness. If you're interested in joining Routes of Yoga for yoga teacher training (which I highly recommend! ), they have upcoming non-residential programs on July 1-24, 2017 and on August 4-27, 2017. 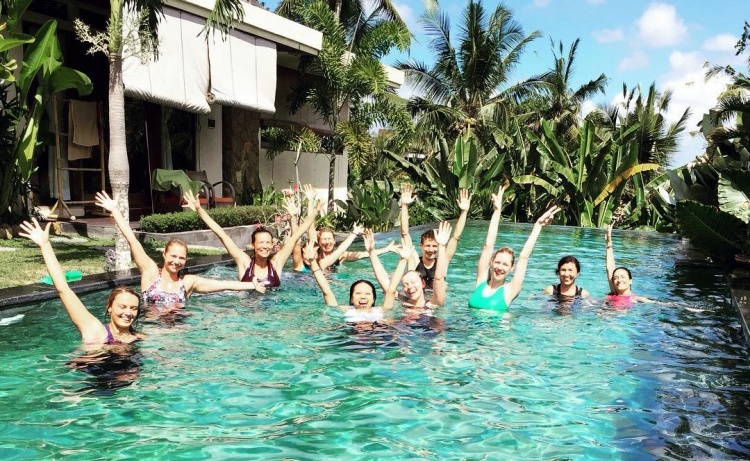 If you want a residential program in Bali just like the one I took, you can join them for the next one in May 2018. They also have a yearly Nepal Yoga Retreat, of which 50% of the profit is donated back to the country.